The J. M. Smucker Company (SJM) engages in manufacturing and marketing branded food products primarily in the United States, Canada, and internationally. The company is a member of the dividend achievers index, and has boosted distributions for nineteen years in a row. The company’s last dividend increase was in July 2016 when the Board of Directors approved an 11.90% increase to 75 cents/share. The company’s largest competitors include Conagra (CAG), Kraft Heinz (KHC) and Hershey (HSY). Over the past decade this dividend growth stock has delivered an annualized total return of 14.10% to its shareholders. I wanted to thank you all for reading the Dividend Growth Investor website. This site is a result of my efforts to improve my investing over time, write down and organize my thoughts, and make myself do the work to form an opinion on companies to invest in. I find it helpful to write down my position on a given topic, and then revisit it a few years later, in order to learn from it. I would encourage all of you to keep an investment journal in private or in public, in order to write down reasons behind your strategy and the investment selections you are making. After a few years, you should be able to learn from your mistakes, and hopefully find ways to improve your results. The way to improve is by gathering data, and analyzing the results against your expectations. I followed this approach to find out the most read articles on the Dividend Growth Investor website. It is very nice to see that my readers are interested in the tools of the trade, such as the lists of dividend champions and dividend aristocrats, which many use as their starting point in their screening process. It is also interesting to see that readers like actionable lists of companies for further research that they can analyze in more detail. A dividend king is a company that has managed to increase dividends every single year for at least 50 years in a row. There are only 20 companies in the US, which have achieved this mighty goal. These are impressive companies to research, because they have been able to overcome several wars, several recessions, high inflation, oil price shocks, and multiple booms and busts. This is a testament to the business models which continued to chug along, uninterrupted by outside competitive forces, delivering goods and services to customers that valued them. Against all odds, these companies managed to grow earnings, and then reward their patient long-term shareholders with a dividend raise for over half a century. The common denominator behind each of those companies is a participant in an industry that is characterized by slow change. The list of dividend kings has increased from ten companies in 2010 to twenty this year. The newest addition was ABM Industries (ABM), which raised its dividend last week. ABM Industries has managed to increase dividends for 50 years in a row. Another new addition in 2016 was Tootsie Roll (TR). The company with the longest streak of annual dividend increases is water utility American States Water (AWR), which has managed to raise dividends to shareholders for 62 years in a row. Each week I review the list of dividend increases as part of my monitoring process. This exercise is helpful in evaluating how my existing holdings are doing, and also discovering other interesting companies for further research. For this weeks review, I have included companies that I believe are close to being attractively valued, or are attractively valued. We have a mixture of companies with a wide range of dividend growth records. I believe that each one of those companies has qualitative characteristics that make their dividends safe. The important trick is to then analyze each company, and initiate a position at the right entry valuation. To many investors and financial professionals, the term investment risk is widely discussed. This term usually entails situations where the value of the investment fluctuates in quoted value. The saying goes that if you purchased Johnson & Johnson (JNJ) at $70/share in 2008, and the stock goes down to $45/share, your risk has increased. I define dividend investment risk as a situation where my investment capital is permanently impaired. If I buy a stock which essentially goes to zero, I would have essentially damaged my capital, as I would be unable to generate much in income from that portion of my portfolio. I would be unable to compound my capital from that point, because anything times zero is still zero. The scenario with Johnson & Johnson stock mentioned in the first paragraph really happened during the 2008 – 2009 bear market. However, the fundamentals of Johnson & Johnson did not deteriorate, and it was still the great business it always was. In fact, earnings didn’t get depressed as much as other industries like Financial Institutions, and dividends kept getting raised and paid like clockwork. Earnings per share increased from $3.73 in 2006 to $4.40 by 2009, while dividends per share went from $1.46 in 2006 to $1.93 by 2009. The company is expected to earn $6.71/share in 2016, and pays a per share dividend of $3.20/year. Incidentally, I find the company to be attractively valued today. Check my analysis of Johnson & Johnson for more information about the company. There is a tradeoff between dividend yield and dividend growth. Investors who start with a higher yield, sacrifice future dividend growth. Investors who choose a lower dividend yield, expect higher dividend growth over time. Neither the future yield, nor the future growth are guaranteed of course. This is where it makes sense to hold different types of dividend growth stocks. My observation over the past decade have been that the companies with low yields are generally ignored by a lot of dividend investors. This is unfortunate, because many of these companies end up delivering outstanding total returns, and high future yields on cost for those patient enough to recognize their potential early. If you are a younger investor, it may make more sense to focus on companies with higher dividend growth, which have a lower yield today. Investors who are retired may shun lower yielding equities, because they are mostly interested in current income that meets their needs. Long term readers know that we go beyond broad generalizations, and dissect trends in financial performance and valuation in order to select the best companies at the best price. The Procter & Gamble Company (NYSE:PG), together with its subsidiaries, manufactures and sells branded consumer packaged goods. The company operates through five segments: Beauty, Grooming, Health Care, Fabric Care and Home Care, and Baby Care and Family Care. This dividend king has paid dividends since 1891 and has managed to increase them for 60 years in a row. Over the past decade this dividend growth stock has delivered an annualized total return of 6%/year to its shareholders. The company has managed to deliver an anemic 2.80% average increase in annual EPS over the past decade. Procter & Gamble is expected to earn $3.89 per share in 2017 and $4.21 per share in 2018. In comparison, the company earned $3.49/share in 2016. Each week, I go through the list of dividend increases in order to monitor performance of existing holdings, and uncover hidden dividend gems. I then narrow down the list by eliminating companies with a short dividend growth streak. I also look at things like trends in earnings per share, dividends per share, dividend payout ratios, in order to determine the likelihood of future dividend growth and growth in intrinsic value. My basic analysis also focuses on valuation and dividend sustainability. McCormick & Company, Incorporated (MKC) manufactures, markets, and distributes spices, seasoning mixes, condiments, and other flavorful products to the food industry. It operates through two segments, Consumer and Industrial. The company raised its quarterly dividend by 9.30% to 47 cents/share. This dividend champion has rewarded shareholders with a dividend raise for the past 31 years in a row. 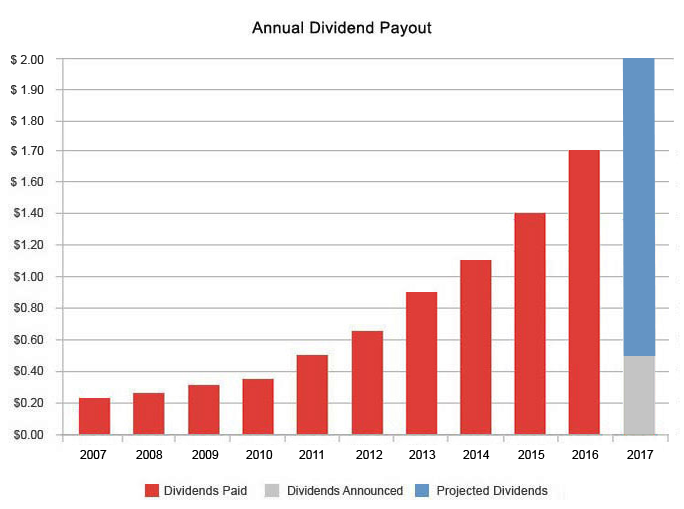 Over the past decade, McCormick has raised dividends at a rate of 9.60%/year. This quality company is selling at 23.50 times forward earnings and yields 2.10%. I would be interested in adding to my position in this compounding machine on dips below $76/share. Check my analysis of McCormick for more information about the company. Regular readers know that I have assets held in taxable and non-taxable accounts. Taxable account provide me with more flexibility in the range of investments I can select, and ease of accessing my money at a moments notice. However, I have to pay taxes on dividends and realized capital gains. Non-taxable accounts ( also referred to as tax-deferred or retirement accounts) allow me to defer paying taxes on investments I have made. These retirement accounts come in all shapes and forms, but generally they allow me to defer paying taxes anywhere from a few decades to indefinitely. Taking money out of them is generally more difficult. It is not impossible however, and worth it, if you are willing to do some planning that will shave years off your journey towards financial independence. This is also not an issue for me, because I am a long-term investor and my investment money is not going to all be needed in a lump sum right away. I have started to ask myself how to optimize my portfolio better. Deciding which assets belong in taxable accounts, and which belong in retirement accounts is one decision that would help me achieve a more optimized result (translation: more money). I want to make sure I am making the best long term asset placement for my portfolio.